Inner Wound Recordings has been making a name for itself of late by discovering an impressive array of power metal upstarts from a variety of persuasions, though there seems to be a fairly strong trend in the past couple years towards the ultra-melodic and Nightwish/Amaranthe side of the equation when considering the likes of Metalite, Angel Nation and Midnight Eternal. 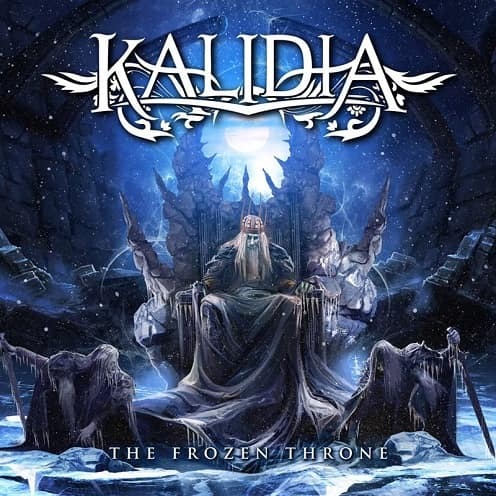 The latest newcomer to the fold to bolster this tendency towards the angelic, female-fronted end of the spectrum is a former symphonic metal cover band turned purveyor of things Gothic and fantastical from Italy now known as Kalidia (they used to go by the more cliche sounding moniker Neverwing). Of the previously mentioned trifecta of mainline power metal acts with a feminine perspective, they tend a slight bit towards the up beat and anthemic splendor of Metalite, but with a bit more of an overt symphonic gloss that would more readily be associated with a number of more speed infused acts such as Amberian Dawn and Kerion. Though they’ve had an eight year run and a few independent releases under their belt, it is with their label-backed sophomore LP The Frozen Throne where their musical journey has truly taken shape. Though possessed of a highly polished symphonic-driven production that would qualify them for the same league as Nightwish-oriented powerhouses such as Epica and Xandria, the full scope of this album functions on a fairly different level. Most of the respective chapters of this musical book rest in Helloween-styled speed metal territory, both from a guitar riffing standpoint and from the generally driving character of the rhythm section. However, despite the implicit 6-string gymnast approach that normally comes along with this sort of package, guitarist Federico Paolini takes on a fairly melodic and reserved tone during his frequent solo sections, having a bit more in common with Emppu Vuorinen than the usual Malmsteen-styled shred fests or slightly less technical Henjo Richter showcases. At the same time, in a fairly refreshing turn away from the Epica sound, the surrounding music doesn’t merely cater to the vocals in spite of Nicoletta Rosellini possessing a powerful set of pipes that could rival Amberian Dawn’s Capri or even Floor Jansen. There is a definite personality to these songs that is equally as strong when the singing takes a hiatus, drawing upon a fairly eclectic array of stylistic influences. If there is a good way to sum up the overall character of this album, it would be as a theatrical affair that displays a series of 11 charming vignettes, featuring the same small acting troupe. Curiously enough, the album seemingly hits its climactic point right at the very beginning with the somewhat Stratovarius-sounding, speed-infused and Neo-classically oriented glory fest of a title song “Frozen Throne”, which is easily both the most memorable song on here and also ironically the longest running at just under 5 minutes. As the rest of the album unfolds, there is a fair degree of contrast in demeanor from one song to the next in spite of the atmosphere being consistently dense and the tempo mostly fast. The somewhat similarly noodling and keyboard happy speeders “Orpheus” and “Go Beyond” differentiate themselves by playing a bit more with quiet, atmospheric moments and slower paced grooving moments, functioning as power metal’s version of a breakdown perhaps. Then again, more mystical sounding affairs like “Circe’s Spell” and “Myth Of Masada”, the latter a riveting duet with Victorius vocalist David Baßin, take on more of a Mid-Eastern vibe comparable to Nightwish classics like “The Siren” and “Ghost Love Score”. Despite having a somewhat lopsided presentation due to the band letting the cat out of the bag a bit early, song for song, this is a full on solid display of power metal with a lot of staying power. Whether things follow the typical blend of speed and classical ornamentation as on “Amethyst”, which is the closest Paolini gets to morphing into a full on guitar her, or where bassist Roberto Donati gets a crack at driving the song for a bit on the more moderately paced “Lotus”, or the all too popular foray into swashbuckling adventures on the power metal seas with “Black Sails”, there isn’t really a whole lot of temptation presented to hit the skip button or to backtrack in order to hear a previous song too quickly as the next one plays. For a band that is just now starting to see an ambitious advertising campaign on their behalf, including no less than three promotional singles with music/lyric videos to go with them, they’ve more than proven themselves worthy of the exposure that they are sure to continue to share in common with the likes of Beyond The Black and Metalite. For the old school Helloween-leaning Euro power metal fan or the newer ones in on the female-fronted craze, one can’t really go wrong here. This entry was posted in Power Metal, Reviews and tagged Epica, gothic metal, italy, Kalidia, power metal, The Frozen Throne, Tuscany, Xandria.